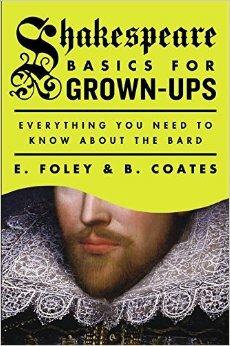 “From the authors of the international bestseller Homework for Grown-Ups, SHAKESPEARE BASICS FOR GROWN-UPS looks at key works – from comedies to tragedies – and the most important sonnets. For parents having to keep up with their children’s homework, those looking to impress on Jeopardy’s next Shakespeare category or casual theater-goers who want to enhance their enjoyment and understanding of scribe, SHAKESPEARE BASICS FOR GROWN-UPS covers the historical context of his writing, personal life, most famous speeches, quotations, poems and more. To enter, please email us at bookwinked@gmail.com before June 25, 2015! Contest open to U.S. residents only. CONGRATULATIONS TO LEANN WHO WON OUR BOOK GIVEAWAY!!! Thank you for entering! This entry was posted in Uncategorized and tagged book give away, june 2015, Shakespeare. Bookmark the permalink.